Tuesday 17 March could be either a red or a black letter day for Harpenden children. It is the day when the government, in the shape of the Education Funding Agency, will say 'yes' or 'no' to the application to build a new and fourth secondary school in the town. This was revealed at a public meeting on 'Schools; Locations and Places' organised by the Harpenden Society on Thursday 26 February. A panel of three speakers, Ben Bardsley, chairman of the Harpenden Parents Group, County Councillor David Williams and Philip Waters, Secretary of the Harpenden Secondary Schools Trust (HSST) which has been responsible for formulating the application. The Trust is comprised of representatives of the three existing secondary schools, Rothamsted Research and the University of Hertfordshire. The mood of the meeting was well-tempered but serious as parents tested the speakers with probing questions. The speakers left little doubt as to the enormity of the challenge. A six-form entry school of 1150 pupils is planned to meet the undoubted and mounting need for places. By 2020 the shortfall will in fact be for some 250 extra places, equivalent of an eight-form entry. If the application is approved it is planned for the school to open in 2017, although it was indicated that tha the first year of pupils might begin their studies before the whole of the development had been finished. Although considerable work has been done in identifying possible sites, with the land cornering the Lower Luton Road and Common Lane the consultants' preferred option, the decision would be taken by the Education Funding Agency with planning permission dependant on the St Albans District Council. The problem is here and now; some 74 extra places will be required this year and a minimum of 120 by 2017. The spectre was raised of what happens if the decision on 17 March is 'no'. 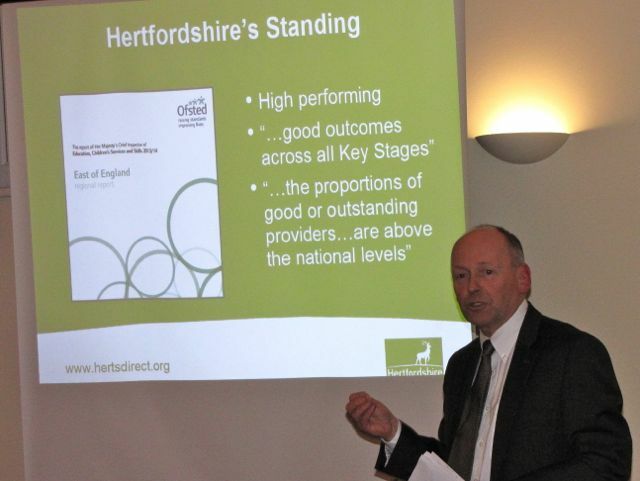 The Hertfordshire County Council has an obligation to find places for all children and the answer was that they would be found - but elsewhere in the county not in Harpenden.